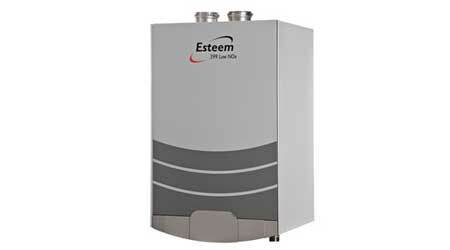 The AERCO Esteem 399 is a wall-hung boiler with a uniquely designed stainless steel heat exchanger with 95% efficiency. It offers all the benefits of the new generation high efficiency, modulating, condensing boilers along with easy installation, low maintenance and high reliability. Delivers up to 95% thermal efficiency while simplifying the venting system. Can be designed with direct or conventional venting made from PVC, CPVC, Polypropylene or A129-4C material to fit any code requirement. Built to withstand thermal shock and eliminates the need for boiler pumping. For more information on the Aerco Esteem, please contact McCotter Energy Systems at 800.950.4822 or by email.